Alonzo’s Sensational Shave Oil is all you need for a perfect shaving experience. Our all natural oils reduce friction while maintaining a close shave. Perfect for reducing razor bumps, ingrown hairs, inflammation, and damaged skin. Our oil is free of ammonia, formaldehyde, PABA, and parabens. No synthetic extracts, no colors, and no fragrances–just nature’s best for your skin. Old fashioned shave gels, foams, and cream just don’t cut it. They may contain harmful chemicals that dry and break out your skin. By using all natural pressed oil you will get a closer, smoother shave while moisturizing your face and replacing key vitamins that promote healthy skin. All you need to do is splash some water on you face, rub in a few drops of oil and start shaving. Grapeseed Oil: Rich in vitamins C,D, and E to reduce wrinkles and tighten skin. Olive Oil: High in antioxidants that have been shown to prevent premature aging and is a great moisturizer that cleanses pores without clogging like commercial moisturizers. Avocado Oil : Absorbed rapidly into the skin to heal dry, chapped skin as well as protect the skin from dangerous UV rays. Apricot Oil: The unsaturated fatty acids and Vitamin E help reduce inflammation and redness in the skin and has been shown to reduce wrinkles and tighten and tone skin. Bergamot Oil : One of the best oils out there, it soothes the skin, kills germs and bacteria, helps with joint and muscle pain, boosts mood, and much much more. If you’ve never incorporated Bergamot Oil into your shave routine then you have been missing out. All Natural Oils – Made with 100% all natural oils for a healthy, clean shave. No harmful chemicals that dry your skin out or cause irritation. Our proprietary blend of natural seed and nut oils will provide perfect lubrication, softer skin, and vitamins and minerals your skin needs. 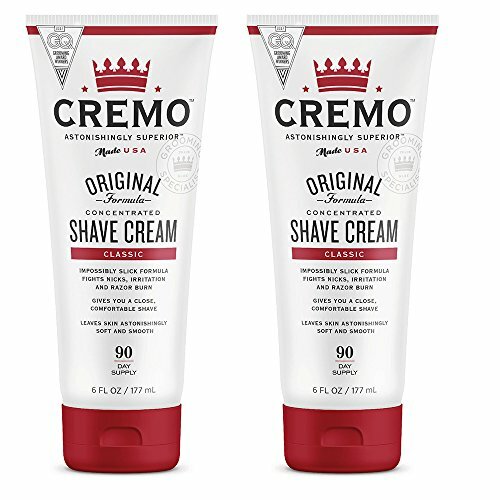 Perfect For Straight Razors – Regular shaving cream dries out your skin and makes it impossible to see where you want to shave. Oil goes on smoother and lets you see the hairs that you are shaving. Silky Smooth Shave – Our Sensational Shave oil will leave your skin incredibly soft. If you have a wife or girlfriend, then you will need to buy two bottles because she will steal your bottle after she feels how silky smooth your face is. Cold Pressed Oils – We use cold-pressed coconut, apricot, bergamot, olive, and avocado oils. How Do I Use It? – It is way easier than you think. All you need to do is splash a little water on your face, Place 3 or 4 drops of oil in the palm of your hand and rub the oil wherever you need to shave. Thats all there is too it. After you are done shaving just massage the remaining oil into your skin and prepare to be amazed. A great shave is within your grasp with Gillette Sensor2 Plus Pivoting Head Men’s Disposable Razor. Featuring Lubrastrip with aloe, a soft Ultragrip handle for great control and a pivoting head that adjusts to the contours of your face. Grooming should be easy. And it is with the Remington Smooth & Silky 5-Piece Body and Bikini Groomer Kit. It includes all the attachments you need to look and feel your best. The bikini trimmer and adjustable length guide are perfect for quick touch-ups and shaping the bikini line. The angled foil shaver gets you extra close, with a hypoallergenic foil to prevent skin irritation. Keep skin fresh with the rotating exfoliator attachment. The dual-sided gentle trimmer easily cuts away unwanted hair in delicate areas, and the precision-edge detail trimmer is perfect for tight spots. Plus, the waterproof design means you can use it in the shower or out to find what’s most comfortable for your skin. Primp and prep your skin for a smooth, close shave with Tree Hut Shave Prep Sugar Scrub. The sugar granules exfoliate skin and lift hair to prep the skin for a close shave. Formulated with Oat Kernel and Avocado Oils, this moisturizing formula leaves a hydrated canvas for soft, bare skin. 100% PURE NATURAL SUGAR – The sugar granules exfoliate skin and lift hair to prep the skin for a close shave. OAT KERNALS & AVOCADO OILS – THIS moisturizing formula leaves a hydrated canvas for soft, bare skin. 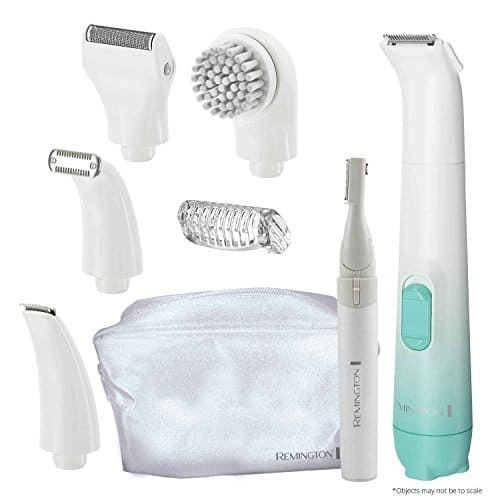 This tool set buffs away unwanted hairs and exfoliates dead skin at the same time. Fast, easy and safe to use. 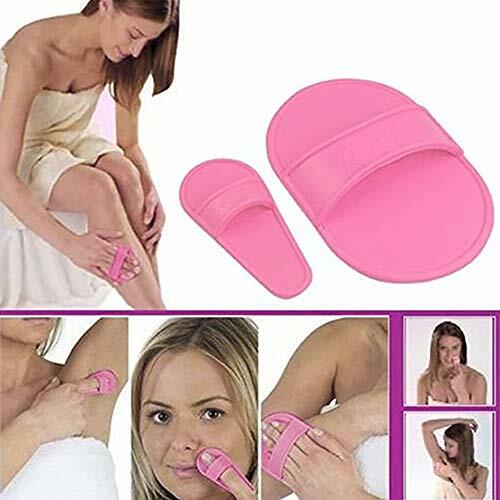 Helps to get smooth healthy skin. No need for electrolysis, waxing or other expensive treatments. Ideal for legs, arms, upper lip as well as bikini line. Note: Due to the light and screen setting difference, the item’s color may be slightly different from the pictures. Directions for a Dream Shave: Rub your skin with hot water for 30 seconds (in the shower works best or use a hot towel). Leave your skin wet, as Cremo Cream is water-activated. Lightly coat your skin with an “almond-sized” squeeze of cream. Less is often best! Add a few drops of water to make and keep it slippery, the shave. If the razor clogs, use more water or less Cremo Cream. The Cream And Plentiful Enough To Cover The Entire Hair, You Must Not Forget Cream On The Skin. Skim If The Hair Is Removed Easily, Removed The Remaining Cream And Then Rinse. Well With Water And Drying. Cream And If Required Can Be Left Longer, But The Entire Process Must Not Take More Than Ten Minutes. Examines Spent Depends On The Density Of The Hair. Superior slickness & cushion for a smooth comfortable shave – Sir Henry’s proprietary recipe incorporates nutrient rich oils such as Kokum Butter, Coconut Oil, and Jojoba Oil for a smooth shave regardless of your choice of razor whether straight, double edged, or cartridge. Sir Henry’s will always leave you clean and comfortable. 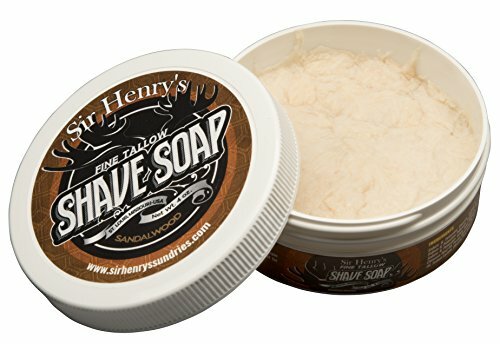 Sandalwood Scent – Sir Henry’s complex mix of oils opens with a pleasant scent of Lavender, gently yields to warm vanilla, closing to a Sandalwood base tying it all together, complimenting your regular post shave application. 100% Pure Essential Oils – Sir Henry’s only uses Essential Oils. No fragrance oils or synthetics. Oversize Container – Allowing you to load or lather your soap directly within the tub. Satisfaction Guaranteed – If not delighted, return within 30 days for a full refund. A lubricating soap designed specifically for shaving. Lubricates the skin and whiskers for a close, smooth, comfortable shave. 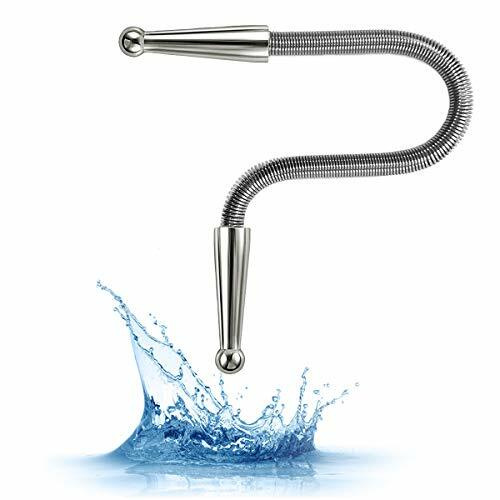 Holding both water and oil together to softens the whiskers and give superior lubrication. It will quickly absorb into the skin to restore, protect, nourishes and moisturizes long after your shave THE KEY INGREDIENTS are very beneficial to the skin. Jojoba oil, aloe vera oil, rosin, glycerin, castor oil, olive oil, and lanolin have been hand selected for their fatty acids and other nourishing ingredients. The skin uses these oils and moisturizers to rebuild and fortify itself. It is rich in nourishing ingredients, so your face feels great after a shave. It is more beneficial to the biological composition of the skin. The chemical compounds found in other shaving products do not necessarily hold the same benefits. 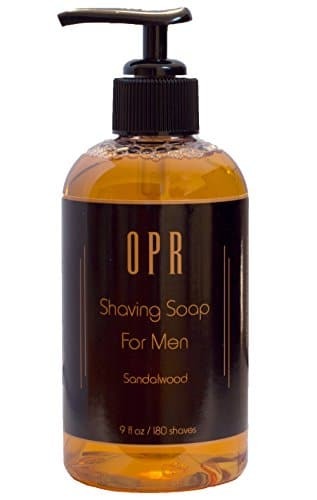 If you have sensitive and cannot shave with a blade, use OPR with a wet electric shaver. You will have no irritation, and get a smooth, close, comfortable shave. Made in the U.S.A. DIRECTIONS: Thoroughly wet your face and neck, 4-8 times. Rub 3-4 pumps of OPR into your whiskers. Add a final splash of water. Now you are ready to shave. Shave by sight and touch, with the grain. Re-wet your face to add lubricity as necessary. SATISFACTION GUARANTEED: If you do not like it simply send it back for a full refund. Rich in SKIN-NOURISHING OILS that rebuild and fortify the skin long after your shave. VALUE FOR MONEY – up to 180 Shaves. No need for Pre-Shave Oil. Also works with electric shavers. Great for SENSITIVE SKIN, but it is scented, so do not use if allergic to fragrance. 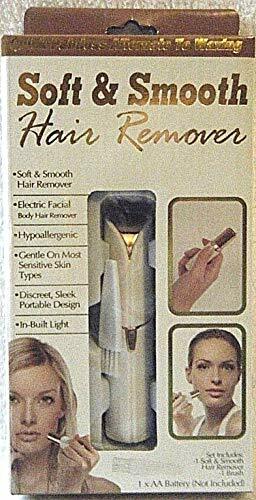 Tekno Soft & Smooth Hair Remover Set Includes: 1 Soft & Smooth Hair Remover, and 1 Brush. Need 1 x AA Battery to run (Battery NOT INCLUDED). Perfect for: Upper lip, Eyebrows, Chin, Cheek, Arms. Quick painless alternate to waxing. 1. Easy to replace the head to change from shaver to hair trimmer/ facial cleaning brush. Upgraded triple-track concave shaving blades fit the contours of your face. 2. Equipped with 3 hair guide combs ( 3mm, 6mm, 9mm) to meet different hair length preferences. 3. Waterproof IPX7, shave dry or wet in the shower. 4. Upgraded LED display allows you to know the shaver’s remaining battery life and other status. Hold on/off switch for 3 seconds to lock the shaver in the off position for safe travel mode. 5. LED display shows these status: Charge indicator / Shave time / Time remaining / Charging status of the battery / Low battery indicator / Cleaning indicator / Travel lock indicator. 4-in-1 MULTIFUNCTIONAL ELECTRIC RAZOR – This electric shaver can trim beard, nose hair and sideburns and remove hair. With advanced 3D floating technology, the beard trimmer can contour to every angle of your face, neck, mustache and even the jaw to ensure a close, smooth shave to reduce irritation. 100% WATERPROOF & USE WET OR DRY – The whole body of this electric shaver is washable, allowing you to enjoy a comfortable dry shave or a refreshing wet shave with shaving cream or gel in the shower. It’s also easy to clean. 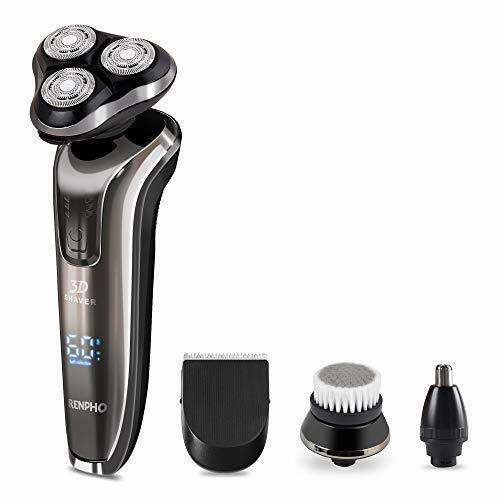 UPGRADED LED DISPLAY & SECURITY LOCK – This electric razor for men has an intelligent LED display, which can remind you about the shaver status, including charge indicator, shave time, and time remaining. Hold on/off switch for 3 seconds to lock the shaver in the off position for safe travel mode, which is also shown on the LED display. 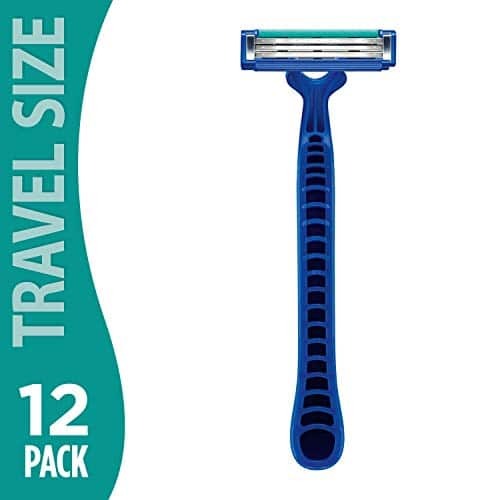 QUICK CHARGING & CORDLESS CONVENIENCE – This men’s electric razor has long-lasting lithium battery, coming with USB charging cable only, which is perfect for your traveling. Charge anyplace & anytime.Please note: wall charger adapter not included. 1.5 hours of charging provides 60 minutes of cordless shaving time. 1 YEAR WARRANTY & LOCAL CUSTOMER SERVICE – 100% Customer Service Satisfaction Guarantee & Local US-based Customers Service office.